Ripple rips higher in the past 24 hours and stands out from the rest of the crypto crowd. One of the recent developments in the past day has been the decision by CoinField to use XRP as a base currencyagainst 22 other assets. The Canadian crypto-exchange is gaining traction. What levels should we watch out for on XRP/USD? The Technical Confluence Indicator shows that on the upside, the first significant target is $0.5819 which is the Pivot Point one-month Resistance 1. The next upside goal for the XRP/USD is $0.6102 which is last month’s low. Both levels are not that strong. Looking down, the first support is at $0.5309 which is the convergence of the Pivot Point one-day Resistance 2 and the previous 4h-high. More significant support is at $0.5195 which is where the Fibonacci 61.8% one-month and the Simple Moving Average 50-15m. 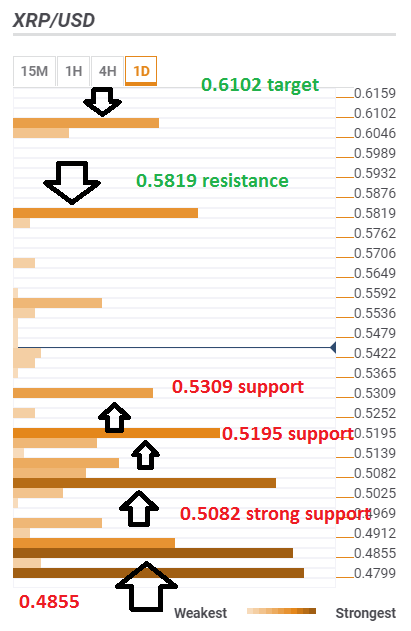 Even stronger support is at $0.5082 where we see yesterday’s high, the PP one-week R3, and the SMA 5-4h. The line in the sand for Ripple is $0.4855 where we see the most potent levels: the SMA 10-4h, the BB one-day-Upper, and the PP one-week Resistance 2.